Straight Stitch Designs is a year old which is a call for a big celebration! 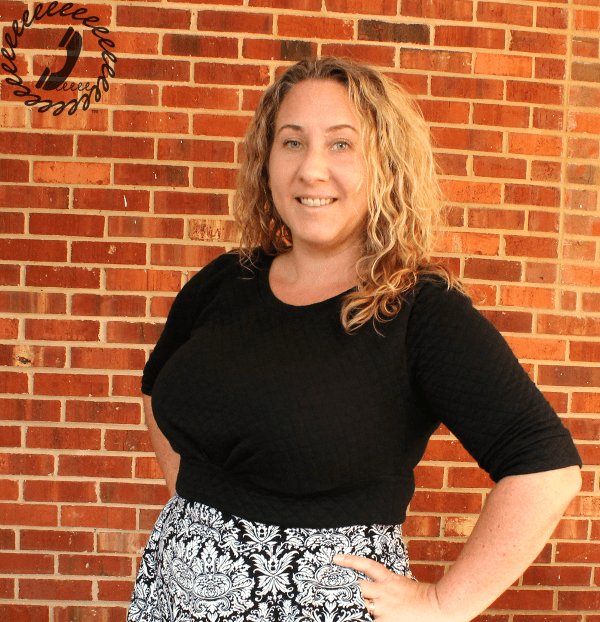 Kimberly launched her first pattern last September and has been on a major roll since. 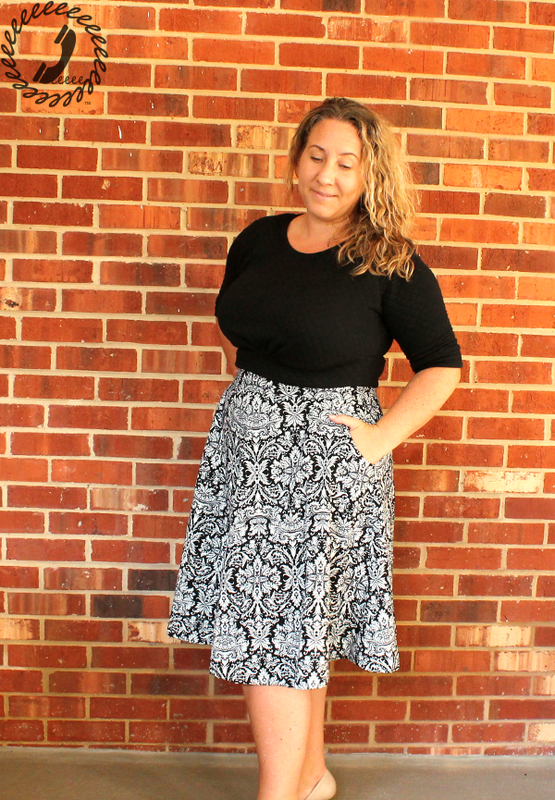 She’s put together a fantastic anniversary tour where bloggers were asked to add a twist to one of her already amazing patterns. I’m an affiliate of Straight Stitch Designs which means if you click over from the links on this page and then purchase, Call Ajaire will earn a percentage at no cost to you. All opinions are mine. I chose to use the Capitol Hill dress since it’s one I had in my stash and was planning for fall anyway. I took this opportunity to muslin the bodice since I knew I’d have to make a few adjustments for my measurements. 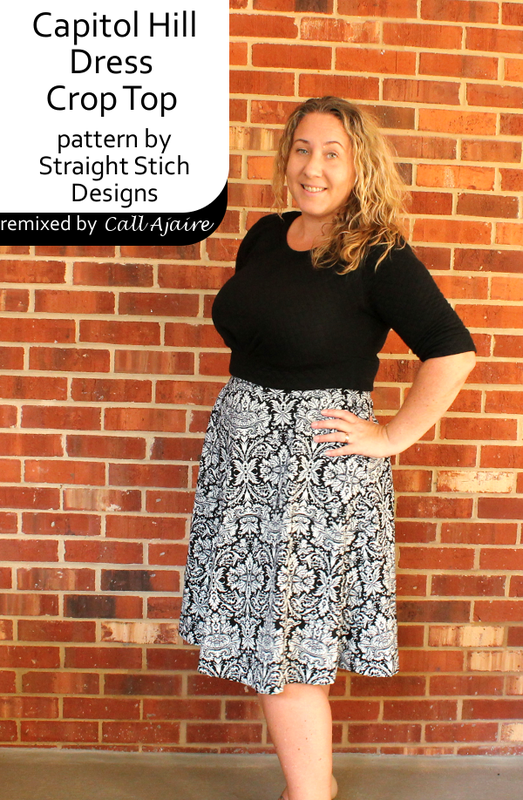 One of the great things about Straight Stitch Designs is that the patterns have size chart measurements as well as finished measurements so you know exactly what sizes things should turn out. That makes altering the pattern pieces super easy. My measurements put me at a 10 on top, 16 at the chest, and 16 at the hip. Instead of doing a full bust adjustment (FBA) to get from the size 10 to 16 I decided to do the cheater FBA since that works well for me in knits. The cheater way is basically to trace the 10 along the neckline, shoulder, and top of the armscye, but extend the armscy to the 16 mark at the underarm/side seam. I do this with the front and back bodice and to the sleeve as well. Sometimes the back piece isn’t necessary to change, but to keep things even I usually do. So that gives me the width I need at the bust, but I also have a large bust depth which is a completely different issue and is addressed in a different way. This only needs to be used on dresses or tops which have an empire or another type of underbust horizontal seam. I needed to add 2 inches to the depth of the bodice so I did a 2″ deep bust adjustment (DBA) at the center front out to the second pleat, tapering to the original size 16 side seam. The DBA increases the amount of fabric in the right places for the bust, but allows for the same side seam depth so the back bodice doesn’t need to be changed at all. I decided that to “remix” this great pattern, I’d make it a cropped sweater to wear with a high waisted skirt or over a simple dress. 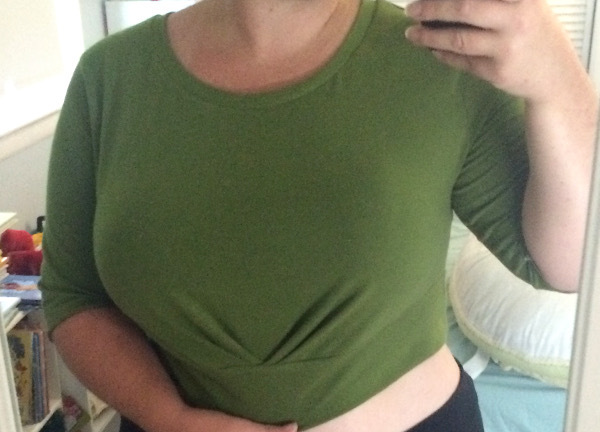 I love that vintage look so I’ve had my eye on a couple of other cropped sweaters lately and thought the Capitol Hill upper bodice would work perfectly. I am super happy with how it turned out. 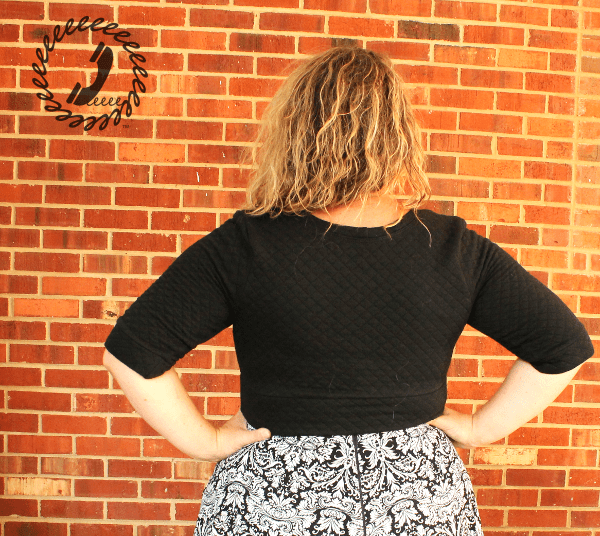 For the final version I used this lovely quilted jersey from Imagine Gnats (*affiliate link). The black isn’t in stock right now, but there’s a pretty pink and a taupe available! The quilted jersey is soft and even though it’s a bit thick it doesn’t feel bulky. It’s like a sweatshirt weight I’d say. This cropped Capitol Hill is exactly what I was picturing. I didn’t have to make any major changes to the pattern either. I used the bodice top and sleeve pieces as is (except for my muslin alterations) and then added depth to the waistband so it would be a bit longer than the original. I sewed the waistband pieces together at the sides, folded them in half so that the fold would be the bottom edge of the sweater, and then stitched the raw waistband edge onto the finished bodice. Super easy and it adds an extra view to the pattern. If the pleats above look bizarre, keep in mind it was almost 100 degrees when I was taking these pictures so this perfect-for-autumn sweater was literally soaked and started to sag haha. 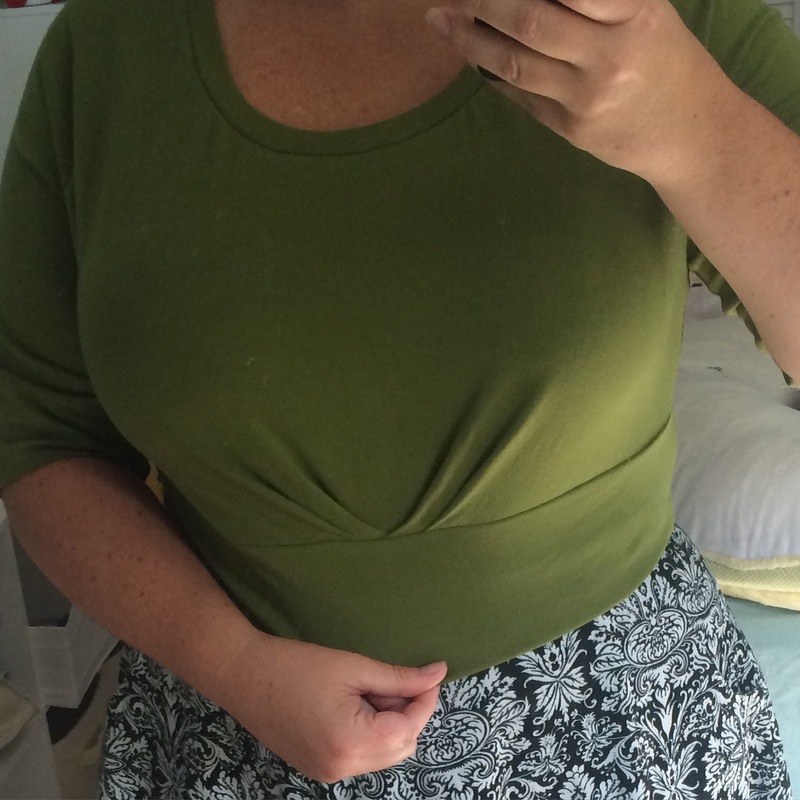 The top pairs perfectly with this Hollyburn skirt I made a couple of weeks ago. The green fabric bodcie I used for muslining is going to become a full capitol hill once I remove the muslin waistband and add a skirt. I just need to decide which fabric to use for the skirt portion and it’ll be an easy finish. It’s nice to have this one project produce two great pieces for my autumn wardrobe. Straight Stitch Designs is having a 50% off sale on all her patterns through the tour, which is an amazing deal. Check out the rest of the tour dates and enter the Rafflecopter giveaway below!